Serve with your fave steamed vegetables and/or a salad. Place salmon, skin side up, on a plate. Drizzle with olive oil. Rub salt into skin. Heat a large, non-stick frying pan over medium-high heat. Add salmon, skin side down. Cook for 4 to 5 minutes or until skin is crispy. Flip and cook, covered for 4 to 5 minutes for medium doneness or until cooked to your liking. Blend the cashews and water in a blender to achieve a smooth, creamy texture. Add in the rest of ingredients and mix together, by hand. Taste and adjust any ingredients as needed. Set aside. Place a layer of your favorite vegetables and/or salad on to a plate. 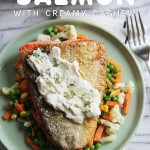 Place the salmon on top and top with the creamy cashew dressing. Enjoy!